Each lesson comes with abundant activities, a brief vocabulary, pre- and post-test option, and an assessment after every lesson so you can measure each student’s understanding of the material. Preparation is teacher-friendly. Try an interactive, Hands on Academics for Careers lesson for yourself, and you will appreciate the creative way this program uses stories, applied activities, pre- and post-tests, end-of-lesson assessments, cartoons, an advice column, and a blog to motivate students. You can use Hands on Academics for Careers as an individualized learning experience or as a teacher-directed activity. Hands on Academics for Careers Ed 2 with The Teacher’s Desktop is available online. Edition 1 without The Teacher’s Desktop is available on CD. 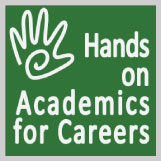 Hands on Academics for Careers is not available on CD. Click here to view two modules from Hands on Academics for Careers. Click here to view Hands on Academics for Careers additional descriptions and module titles. When you use the online version of Hands on Academics for Careers with The Teacher’s Desktop, your time-consuming tasks will be greatly reduced by these shortcuts. You may view The Teacher’s Desktop with Job Ready Career Skills to see typical functioning.